The Thamshavn Railway is in many ways a very unique railway. Not primeraly because it was a narrow gauge railway. 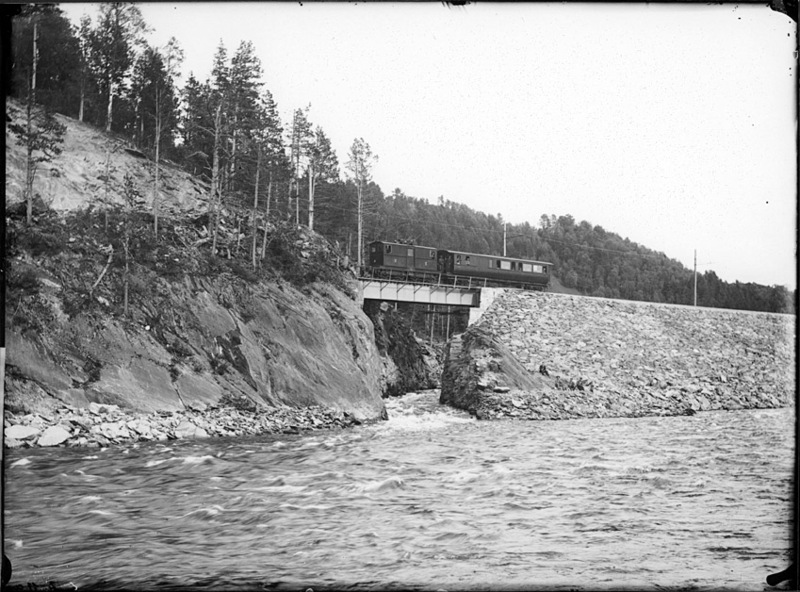 Most of the Norwegian railway lines were originally built as narrow gauge lines (1067 mm) and later converted to standard gauge. But the Thamshavn railroad was built to the gauge of 1000 mm, and from the opening in 1908 it was fully electrified. This makes it one of the very first electric lines in Europe, and quite possible the oldest operating alternate current railroad in the world. It was also a privately owned railroad company during its full 65 years of service, itself a rariety in a country were nearly all the railroads were run by the state. The line runs from a small coastal town in central Norway, Thamshavn, to the mining community of Løkken some 25km further south. The line´s reason for being was the transport of copper and sulphur ore from the mines at Løkken to the shipping facilities at Thamshavn where the ore was transfered to boats for export. The line is first of all the result of one mans vision. The local business tycoon Christian Thams took an interest in the mining operations at Løkken after he inherited his fathers company. The mines had been in operation since the 16th century, but operations had been shut down in the late 1800´s. Partly due to water filling the mine shafts, and partly that it was difficult to make a profit by transporting the ore up to the coast by horse and sled. Mr. Thams concluded that both problems could be solved by employing a relatively new technology: electricity. He envisioned using electrical pumps to empty the mines, and to build an electric narrow gauge railroad to solve the transport problem. The topic of this article will naturally be the latter. It is quite clear that Mr. Thams liked to see himself as a man employing cutting edge technology. The electric motor technology at the beginning of the 20th century was at best experimental. Before the Thamshavn railroad was built, the only elctrical railroads in Europe were a couple of interurbans in Germany. A heavy-duty ore railroad was an entirely different matter. But even if choosing to build an electrical railroad was daring, it made some sense. As mentioned earlier, the reopening of the mines required electrical power, and the waterfalls of the region provided far more electricity than was needed for the mines. Construction of the railroad started in 1906. The locomotives and all the electrical equipment were purchased from British Westinghouse. In 1908 the line reached the small community of Svorkmo, 20 km from Thamshavn. The grand opening took place the 10th July 1908 and was led by H.M King Haakon 7. The original plan was that the line should terminate at Svorkmo. The ore should be transported by aerial tram from Løkken, but the company soon decided that it wanted to extend the railroad all the way to Løkken. This was meant to be an industrial branch with no passenger service, but goverment regulations demanded that also this part of the line should be operated as a common carrier. The line was therefore ”reopened” in 1910 at Løkken. So the ”Thamshavnbanen” ended up as a 25,4 km long common carrier from Thamshavn to Løkken. From Thamshavn to Svorkmo it was built to the same standards (expect for, of course, the gauge) as the so called ”class II” standard gauge railroads of Norway. This meant 1.33% grades and a minimum radius of 250 meters. From Svorkmo to Løkken the line was built to the original planned branchline standards that included quite dramatic 3.6% grades and a minimum radius of 60 meters. During the first operating years the line operated three electrical locomotives. In appearance they were quite similiar to the ”boxcab” electrics of the American interurban lines of the Twenties; wich quite frankly means they are ugly as sin. Almost as to compensate for the ugliness of these three little stooges Thams also ordered a a self propelled electric private car. This private car is maybe the most beatiful piece of railroad equipment operated in Norway ever. The interior is in carved oak, and it is said that Thams sent his best craftsman (Thams also owned a big carpentery factory that among many other things produced Europe´s first prefabricated houses) to England to work for more than a year on the cars interior. The seats are covered with buffalo leather. The car has of course electric lighting, and the lightbulbs have engraved company logos. The bulbs are coalthread bulbs from Edisons original factory. Since King Haakon rode the car on the opening day, the car was naturally called ”The Royal Car”. This name probably carries a somewhat double meaning as there is no secret that Thams looked at himself as a ”king” of the Orkla valley where the line operated. For the more mundane tasks of transporting mere mortals and ore, the line had four wooden passenger cars and two-axle wooden ore cars. Despite the low tide of the world economy, the first years of operation were a success. Both the amount of ore and the number of passengers exceeded all expectations. In 1910 the line carried 82 000 passengers and 50 000 tons of ore. These numbers grew in the years up to World War One, and it was therefore neccessary to upgrade the line´s capacity. In 1910 the line aquired two passenger railcars. It was soon discovered that these railcars with their power of 300hp each were powerful enough to be used as locomotives, and they were used in all classes of trains. ”The three stooges” with their far more feable 160hp each were degraded to helper service and switching. In 1916 the company ordered two more engines from the Swedish company ASEA. They were delivered in 1918. Weighing in at 44 tons with four engines each, they produced 560hp pr. engine. A series of steel ore cars was also aquired. The track was upgraded with heavier rail and crushed stone ballast. The look of the line become more the one of a heavy-duty mainline than that of a rickety narrow gaugeline! Even before the outbreak of World War II much of the ore was bought by German companies. After the German invasion of Norway on the 9th April 1940 there was a short break in production, but as early as mid July the same year operations had resumed. By striking a very fine balance the mining company avoided a German takeover of the railroad and the mining operations. This was however a strategically very important production, since sulphur among other things is an important ingredient in munition production. The allies quickly drew up plans for stopping the production. Aerial bombing would have been the simplest solution. However, the norwegian exile government in London was very much aginst aerial bombing due to the large risk of civilian casualties. It was therefore decided to halt the operation of the railroad using saboteurs trained in England. These saboteurs managed to blow up all of the locomotives and both the railcars. To compensate for this the Germans brought in steam engines from Germany and France. But it was not possible to find enough meter gauge engines. It was decided to install a third rail, making it possible to use standard gauge engines while the ore cars still ran on the meter gauge track. This work was completed in May 1945, only days before the German capitulation, and this work was therefore a total waste. The quality of the work was poor, and the Norwegian State Railroad that had unvillingly provided the rail needed it for other projects. The third rail was ripped up without ever beeing used, and the railroad was restored to meter-gauge. Four of the electric engines were rebuilt. The wooden railcars were impossiblle to rebuild. Luckily, ”The Royal Car” survived the war. The Germans had tried to press it into service as a locomotive, but the motors were too weak. 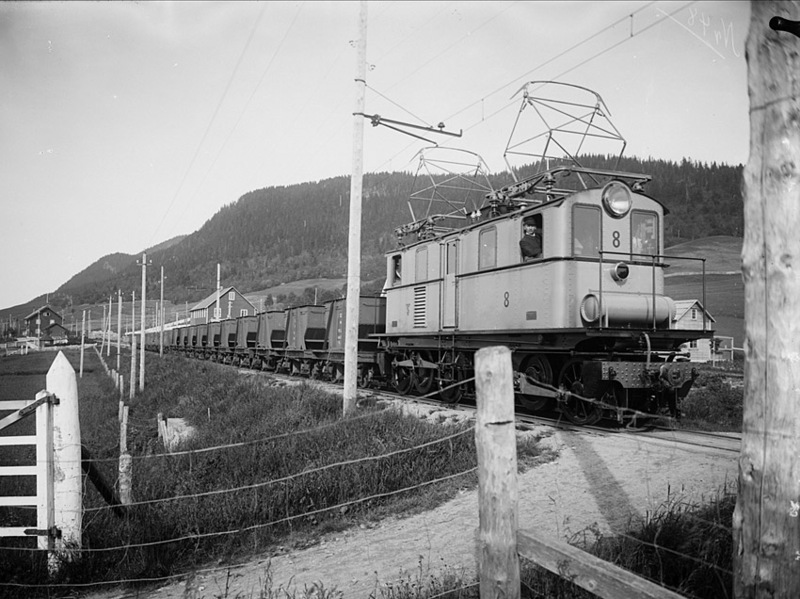 After World War II, two diesel engines were delivered from England as well as three Norwegian electric engines. However, these were not great times for the railroad. Much of the passengers were lost to buses. The railroad had seen this coming, and ironically the buses that took away the passengers from the train was operated by the same company that owned the railroad. Passenger service on the Thamshavn Railroad was abandoned in 1963. Freight operations got a somewhat longer life, but lower activity in the mines and transport by trucks led to the end of operations in 1974. The plan was to immidiately rip up all trackage and use the railroad grades for roadbuilding projects. In the last minute the plans were changed. The railroad should no longer be abandoned, but put in ”sleeping mode” so operations could resume in case of an upturn in the world market for sulphur ore. So the end of the story was that all the equipment was locked up, and everybody just went home. The equipmment was well maintained during ”the sleeping years”. Regular operations never resumed, but there was an excellent starting point for a museum railroad. In 1983 the railroad was awaken from its sleep. Museum trains began operating between Løkken and Svorkmo, and it is planned to eventually run trains on the full length of the railroad. Most of the original equipment is still operational. The museum trains mostly use postwar engines, but they also use one of the original Westinghouse engines from 1908 from time to time. Even one of the ASEA engines from 1918 is kept in running condition. In addition ”The Royal Car” is kept in good shape and is available for charter service. In Løkken most of the material is displayed in a museumbuilding when it is not running. A large part of the mining complex at Løkken still remains. Among other things you can find the remains of a 600mm mining railroad. It is possible to explore this area quite freely, and the mine itself is open for guided tours. Please feel free to contact me if you happen to visit the Thamshavn Railroad!